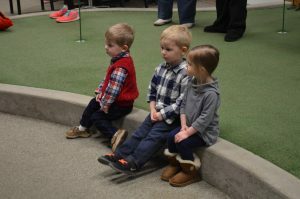 Our youngest golfers learn fundamentals, working on coordination, simple techniques, and motor skills. Adults learn to help their child practice and develop these skills. *No class on November 22. 337013-35 3 - 4 Th Nov. 8 - Dec. 6* 5:30 - 6 p.m.
337013-36 3 - 4 Th Nov. 8 - Dec. 6* 6:15 - 6:45 p.m.
337013-37 3 - 4 Th Jan. 10 - 31 5:30 - 6 p.m.
337013-38 3 - 4 Th Jan. 10 - 31 6:15 - 6:45 p.m. 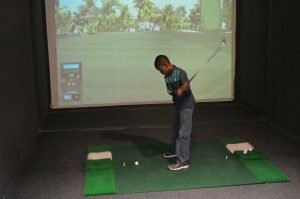 In this fun intro to golf, juniors learn ball striking and putting fundamentals, golf rules, and etiquette. Clubs are available if needed. Students may transfer between classes with instructor approval. *No class on November 20 – 21. 337033-65 5 - 7 T Nov. 6 - Dec. 11* 5:15 - 6 p.m.
337033-66 8 - 12 T Nov. 6 - Dec. 11* 6:15 - 7 p.m.
337033-67 8 - 12 W Nov. 7 - Dec. 12* 5:15 - 6 p.m.
337033-68 5 - 7 W Nov. 7 - Dec. 12* 6:15 - 7 p.m.
337033-69 5 - 7 T Jan. 8 - Feb. 5 5:15 - 6 p.m.
337033-70 8 - 12 T Jan. 8 - Feb. 5 6:15 - 7 p.m.
337033-71 8 - 12 W Jan. 9 - Feb. 6 5:15 - 6 p.m.
337033-72 5 - 7 W Jan. 9 - Feb. 6 6:15 - 7 p.m.
Take your game to the next level with assistance from the Park District pros! 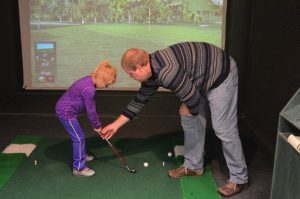 Intermediate is designed for youth aged 10 – 17 who have previous experience in the Junior Golf program. *No class on November 19. 337043-19 10 - 17 M Nov. 5 - Dec, 10* 5:30 - 6:30 p.m.
337043-20 10 - 17 M Jan. 7 - Feb. 4 5:30 - 6:30 p.m.